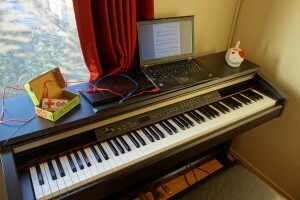 It’s always been a bit awkward for me to play from sheet music that is being displayed on a laptop on top of the piano. I’ve been doing this for a long time, but advancing to the next page is pretty inconvenient. The other day however, I put two and two together and came up with a solution. For Christmas last year, I got something called “Makey Makey”, a small printed circuit board that acts as a (USB) keyboard (or mouse). You attach two cables to the board, one to ground and the other to a “pin” on the circuit board. When you create a circuit by e.g. letting the other ends of these cables touch one another, a key stroke or click (depending on the selected pin) is sent to the computer. The board has left, right, up, and down, as well as space and click, though if I remember correctly, you can get it to output other key codes too. The idea is that you can use anything to complete the circuit: bananas, Play-Doh, water, or your own body. So when playing the piano, your feet, especially your left foot, aren’t very busy. You may have three pedals, but only need one all the time. So can we maybe use the middle pedal to advance our score? Yes, we can! 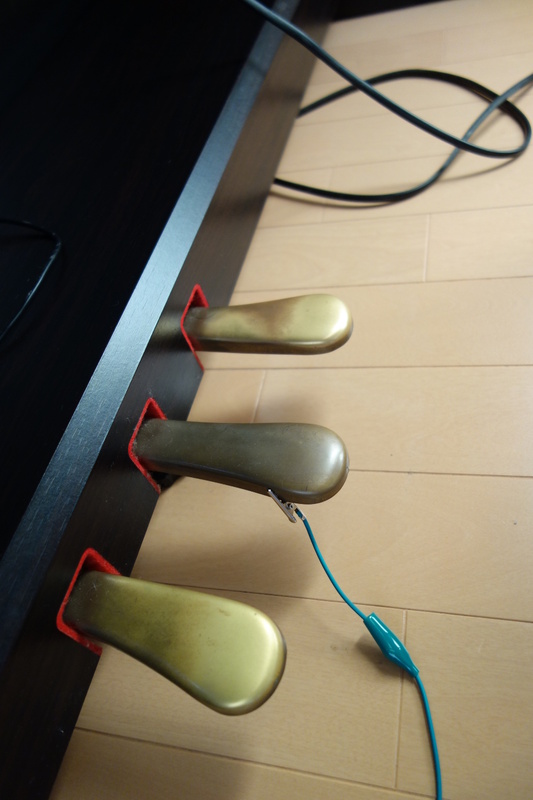 My Clavinova has pedals that are made of metal. (This probably contributed to my idea a bit.) 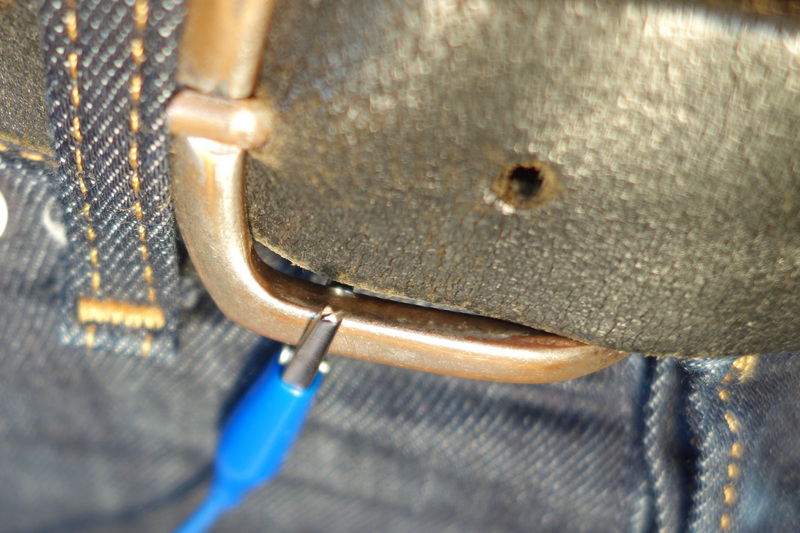 All you have to do is attach one cable from ground on the circuit board to your body (my belt buckle is made of metal and touches my skin). The other cable is attached to the middle pedal. (The cables that come with the kit have alligator clips, which makes this very easy.) Now just take off your left sock (or wear a sock with a hole in it :p). 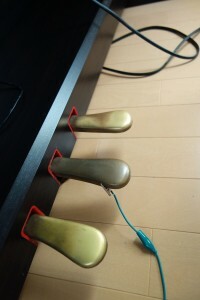 Awesome, by touching the middle pedal, you can scroll down. If you’re lucky, that’s the end of it. But in my case, the other pedals scrolled down too! Apparently my piano’s pedals are all connected to another. Hrm. And that’s where you do not give up, but see how you might be able to MacGyver the situation. If you e.g. have sticky tape and a coin, that would work. I didn’t have any tape, but I had plastic wrap and aluminum foil. 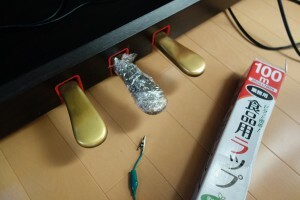 I first wrapped the pedal with the plastic wrap for electrical insulation, and wrapped the result with the aluminum foil. 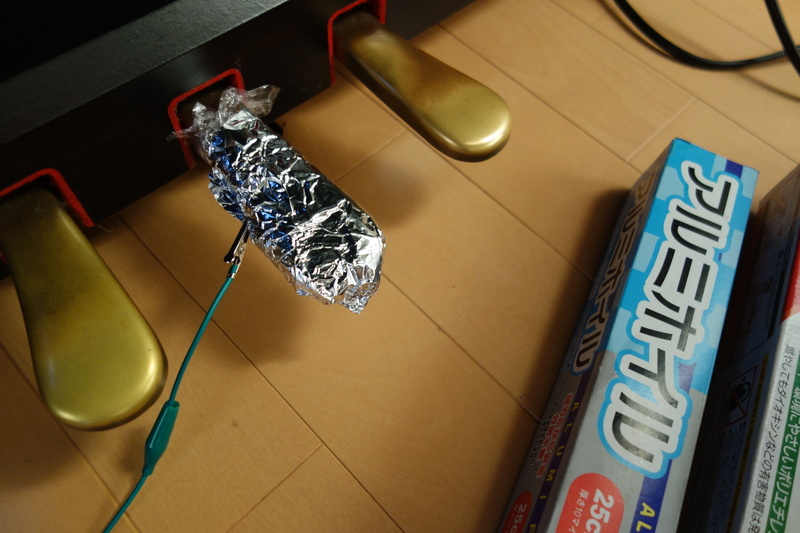 Then I attached the alligator clip to the aluminum foil, and everything works as planned. 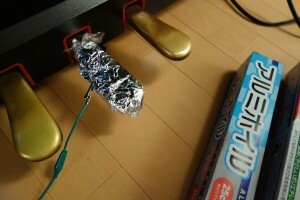 Make sure to make a thick bulb of aluminum foil to attach the alligator clip to. Otherwise the alligator clip will just cut through the foil. There are times when you would also like to be able to scroll back up. I haven’t implemented that yet, but it wouldn’t be hard to divide the middle pedal into an up button and a down button depending on where it was touched.